This is what I’ll be reading -my worlds are colliding! Matt Harvey, Leanne White and Warwick Frost (editors), Wine and Identity: Branding, heritage, terroir. Routledge, 2014. The premise of this interesting collection of academic papers is that the global wine market is highly competitive and rapidly changing and, in this dynamic environment, identity has become an increasingly important factor in the way that wine is thought about, experienced and especially how it is marketed. 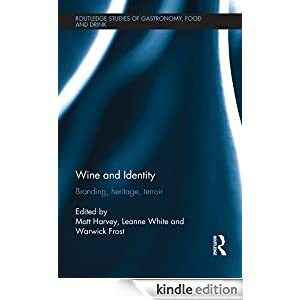 Harvey, White and Frost, Australian professors of law, marketing and tourism respectively, analyze wine and identity in terms of heritage, branding and terroir — three flexible but useful “created” concepts. You might think that heritage and terroir are historical and natural phenomena whereas brands are manufactured by marketers, but when you think about it heritage and terroir are subject to the same story-telling factors as commercial brands and are perhaps more powerful because unlike a created brand they bring with them a sense of authenticity. ← In a pinch Pinot Noir.